When it comes to grooming and taking care of a men’s body, seems like the list is not going to end pretty soon. So, this time I am going to talk about some of the best body wash for men available in the market. Of course, there are plenty of them and choosing the right one can be a tricky business. 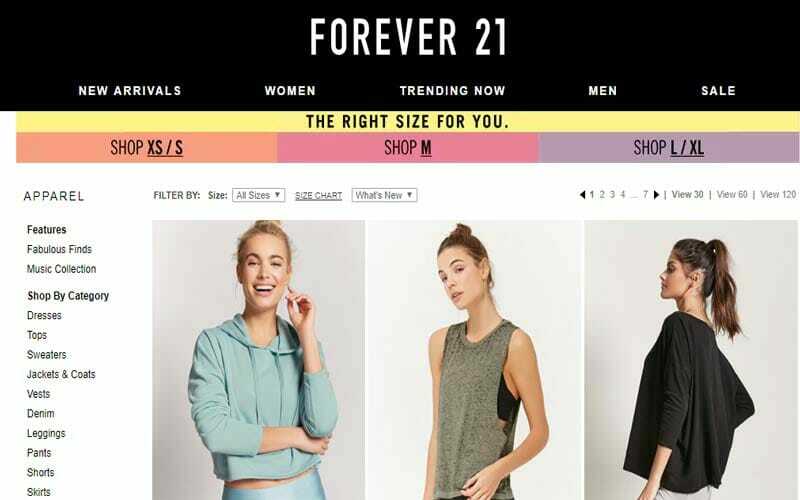 There are like hundreds of brands offering a variety of stuff but each one of them are different and you should better know what your body wants before you buy these products. This is why, with great analysis and a lot of research I created a section which is not only about the best body wash but also about the guide to pick the best out of all. As I always recommend, if you are not aware about certain kind of products as you never used them before, you should better gather entire information about them. This is why going through an elaborated buying guide can bring you the piece of knowledge you were not known to earlier. And hence you should go through this buying guide I curated for buying best body wash for men. Did you even know that there are certain kinds of body wash available in the market? Well, of course, there are plenty of variety but I managed to bring them in the major categories of body wash which are actually requirements based. If you are suffering from dry skin issues then Shower gels are the perfect kind of body wash you would like to use. What makes them best body wash for men struggling with dry skin is that they are comparatively thicker and contains less amount of detergent in them and hence remains extremely gentle on your skin. If you think your body is not moisturized enough, gel wash is the solution for you. If you are more prone to physical activities all day long at work then you are obviously more prone of getting dirt deposits on your skin as well. However, normal soaps are not able to get this dirt out of your body effectively and hence you need exfoliating body wash for it. This is quite like scrubbing your skin and it effectively removes the dirt as well as dead skin from various parts of your body. Moisturizing body wash are somewhere different from shower gels because they work on keeping your skin hydrated all day long. Whereas, shower gels are more suitable for a chronic after-bath dryness only. So, if you are feeling that your skin stretches tightly even when you smile, you should immediately switch to moisturizing body wash. This is so important to consider your skin type before buying any type of grooming and skin care products. So, before you take a detailed study on best body wash for men, you should better take a look at the types of skin most people have. People having sensitive skin are the ones who should be extra cautious while buying any product for their skin. So, while most of the ingredients do not your skin type, you should rather invest in only organic products (no naturals too). For the dry skin type, I have perfect solution of either shower gels or moisturizing body wash too. Such body wash does not open up the pores of your body and your skin remains more nourished for a longer duration. Acne is the most common type of skin condition that usually young generation suffers from. These people should better use antibacterial and anti-fungal type of body wash on their body. Like I always say, the ingredients must be natural or organic and the same applies to picking best body wash for men too. Also, you should especially stay away from the sulfate based products because they are really harmful for your body especially when you are having a sensitive skin. Moreover, natural ingredients also leaves your body fresh all day long and that too with a natural fragrance. One thing that most people forget to focus on is the shelf life or expiry time of the body wash. Rather than just focusing on the ingredients and price, you should see that whether it lasts for a year or not. A general body wash should have a shelf life of at least 18 months. Although it may not last that longer if you take regular showers but still it is important to have that much of time handy. We are talking about best body wash for men here and hence fragrance plays an important role while picking out the best for yourself. Make sure that whichever body wash you pick, it must not contain any hint of synthetic fragrance in it because it makes your skin dry and cause itchiness too. You can either go for naturally scented or totally unscented body wash options too. So, like I do in all the section, I am going to pick only 10 of the best body wash for men here because of course, buying the same product from a variety of brands is not smart at all. On the basis of comparative analysis and a variety of products available in the market, I picked out a bunch of them which I am sure you would love to try out. 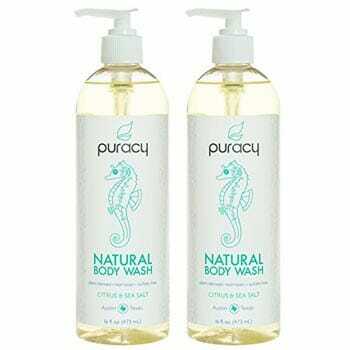 Puracy brings you a completely natural body wash which is entirely sulfate free and can be used by both men and women. It is one of the best men’s body wash and generally purchased in the pack of 2 and hence I mentioned the same packaging option here too. This body wash comes in the form of a shower gel which is quite thick. Because of the involvement of natural ingredients, the fragrance of this body wash is also natural and quite balanced too. Despite having no sulfate, it creates rich lather because of coconut based cleanser used in it. There are other ingredients like sea salt and citrus which helps in maintaining the moisture of the body and prevents it from going dry. You can use it on a daily basis and it causes no side-effects on skin as well. Other important elements of this best body wash for men is that it is 100% gluten free, vegan, non-toxic, biodegradable, hypoallergenic and of course entirely naturally derived too. It cleanses the body effectively and the light citrus fragrance leaves you with a fresh vibe for all day long. Art Naturals is a very popular skin care brand and this time it brings you one of the best body wash for men which is quite affordable and refreshed your body too. 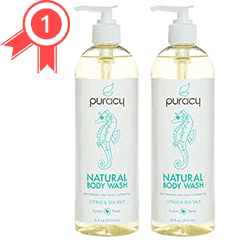 This natural body wash is also a type of shower gel which is made up of natural ingredients only. However, unlike earlier product, it is especially created for men only and cannot be used by women. For the rough skin of men, it deeply cleanses it and leaves with very refreshing smell. Some of the ingredients of this body wash are Shea Butter, Aloe Vera, Cocoa Butter and a blend of essential oils which helps in pertaining the lost moisture of the body. In fact, apart from keeping the skin nourished these ingredients also helps in clearing up the blemishes and acnes too. 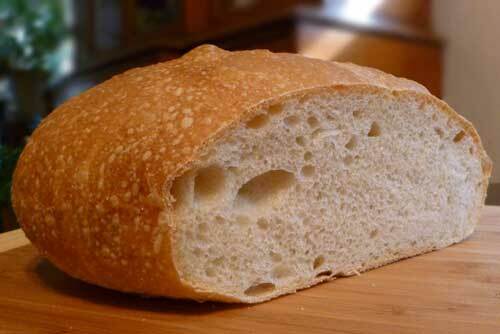 Despite having high butter content, your skin won’t feel greasy at all. If you are someone suffering from bad odour then the tea tree oil in this body wash will help you in getting rid of it in no time. In fact, the anti-sceptic formula of tea tree oil fights with germs and bacteria too and add a very cooling fragrance to your body. If you are suffering from a variety of skin issues then I am sure you would have been looking for men’s moisturizing body wash which can provide you an overall solution. In such case, I think you should go for this Antifungal body wash by Purely Northwest. It is ideal to be used by both men and women and contains clinical properties which provide a very effective and soothing results on your skin. 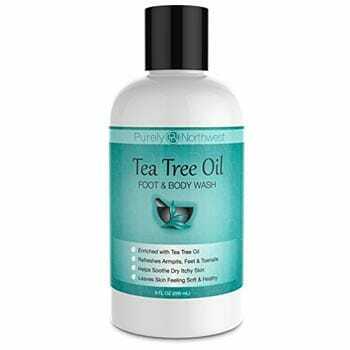 This tea tree oil based body wash also helps in curing athletes foot, jock itch, ringworm, eczema, acne, toenail fungus and other skin issues. This clearly means that if you are suffering from sensitive skin then you should definitely use this Purely Northwest body wash. Moreover, this best body wash for men promotes healthy skin and effectively works on feet issues mainly. It contains no parabens, silicon or any other component of synthetic fragrance at all. You can find some of the most amazing natural ingredients in it like Aloe Vera, Oregano, blend of tea tree and essential oils, Vitamins, peppermint and other refreshing components. The next in the list of best body wash for men is the tea tree oil soap for body and face by Oleavine. It also contains the amazing properties of Neem oil which helps in restoring the complexion of body and face without the need of any harmful chemicals. As it is made up of natural and organic ingredients, it helps in fighting with common skin problems too like skin irritation and even tanning too. They have not used even a hint of detergent, sulfates, silicon, preservatives or any sort of thickeners in it which means you receive it in its natural form. Despite that it produces a very rich lather for which even a little amount of this body wash is enough. You can use it on daily basis and it is even more ideal for athletes. Some of the natural ingredients of this product are essential oils, Omegas 3, 6, 7 and 9, tea tree and Neem oil, antibacterial extracts and many more. And this is why by using this body wash on daily basis, you get overall protection against skin issues like ringworm, acne, toenail fungus, dryness, itchiness, yeast and many more. Talking about the shower gel for men then you can opt for this choice by Selenium which offered a very natural organic body wash for men. This body wash is ideal for everyday use and comes with Sapropel extracts vitamins and biological stimulants which keeps the body fresh and energetic throughout the day. It is made up of entirely organic ingredients which means there are not even processed natural products used in it. This is the reason this body wash is suitable for all types of skin. In fact, it can not only be used by men and women but you can also use it as kids and baby shower gels too. They remains super soft on skin and causes no irritation or flakiness. The product is 100% biodegradable and the antibacterial properties also keeps you away from skin issues. This is a very ideal and best body wash for men especially for those having super sensitive skin. This shower gel is an amazing combination of comfort and freshness and also keeps you refreshed for all day long. Dove Men + Care body wash is a special product which is highly recommended for maintain the hydration level of the skin. You can use it for healthier and flake free skin and the effects of this body wash lasts all day long irrespective of the activities you do. You just need to take a small amount of this body wash in your hands and produce lather before applying it on the damp skin. The micromoisture hypoallergenic formula of this body wash activates and locks the natural moisture of your body so you do not feel itchiness or dryness for the whole day. 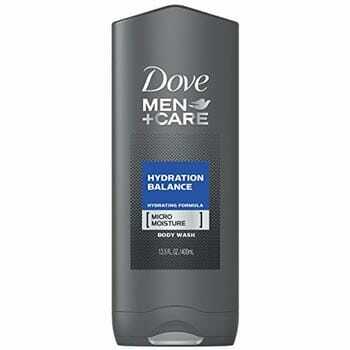 This is the best body wash for men suffering from dry skin problems. It comes in the form of a shower gel but because of the ultra-light nature, it rinses off easily. You can also find a variety of Dove products but this one is specially made for hydrating skin only. The Dove Men + Care body wash is so mild that not only it is suitable for regular use but also suitable for face too. 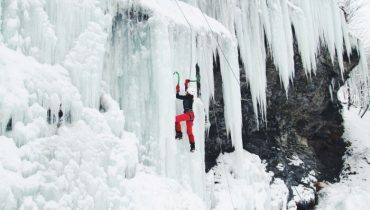 In fact, the nourishment of this product makes you feel more refreshed than ever. 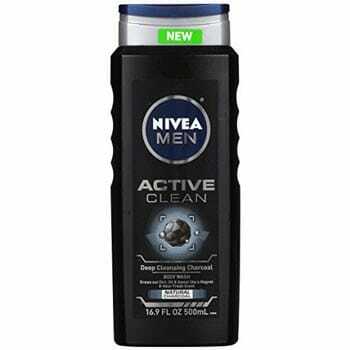 The next product I chose for the list of best body wash for men is Nivea Men active clean body wash which comes with natural charcoal. This package is consisted of 3 counts and this body wash is super effective for drawing out dirt and harmful micro particles out of your skin like a powerful magnet. I really liked the fact that it deeply cleanses out your skin without even causing any type of dryness or deposits of flakes over it. This is why it is one of the most amazing men’s exfoliating body wash too. The scent which naturally comes out after its application lasts for at least 8 hours further depending on your lifestyle. This is also dermatologically tested and specially developed for the harsh skin of men. This Nivea men active clean body wash provides a freshness which is long lasting and hence keeps you active and refreshing for a longer duration. However, as its primary feature is exfoliation, it contains mild usage of chemicals too and hence not prescribed for men having sensitive skin or other skin issues. 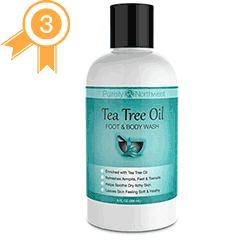 Natural products prove to be the best ones for your body and this tea tree oil based antibacterial body wash by Premium Nature is a perfect example of this. It comes with antifungal properties so if you are having skin problems like ringworms, dryness, itchiness, eczema etc. then it will prove to be a great herbal cure for it. It also comes with a blend of essential oils and soap which cleanses your body quite effectively and the shower gel formula produces rich lather too. People who perform more physical activities should definitely use it as it helps in fighting with the bad odour and athletic foot problem too. They have used only natural ingredients in this product like aloe, peppermint, eucalyptus, jojoba, rosemary etc. which helps in maintain the natural moisture of the body. The pricing is also quite affordable and I am sure you will love the herbal rich formula of this body wash and its results on your skin type. It makes a perfect pick for the category of best body wash for men and I am sure you will like the smooth and lustrous glow of your skin after its use. 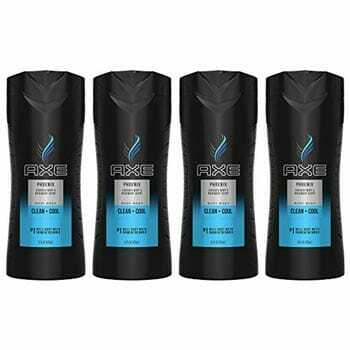 If you are looking for best smelling body wash for men then Axe Phoenix is the one you should go for. This one mentioned here is a pack of four and this packaging turn out to be quite economical on pocket too. What makes Axe Phoenix one of the most amazingly smelling body wash is the kind of ingredients used in it. To name a few, it contains geranium, coumarone, lavender and citrus blend in it. This combination not only smells amazing but also turn out to be quite refreshing for your body. This is just the right product to start your day with and of course to end up with too. If you think the smell will turn out to be fruity then you should know that it also contains blend of wood which turn this fragrance into a manly scent which is powerful enough to last for whole day. You can also use other Axe products with it to increase the effect of fragrance. However, while using it, remains cautious and avoid its contact with your eyes else it can cause irritation. So, finally, the list of best body wash for men is about to end and the Old Spice body wash makes it to this category as the final pick. You should be known to the fact that Old Spice makes special products for men which leaves you smelling manly and provides complete solution to your problems too. This high endurance pure sport body wash by Old Spice is specially made for men who perform heavy physical activities throughout the day and wants a better solution to their various skin problems. Taking a bath with this body wash is quite like wearing an armor of manly scent which lasts for all day. It also deeply cleanses your skin and you can easily rinse it off your body with one wash. Moreover, the only problem regarding this product is that it is not suitable for sensitive skin type. By the term high endurance they mean that the effect of this body wash lasts quite longer than other usual body washes. Hence, it is ideal that sporty man must use this Old Spice body wash to cop up with stubborn dirt and micro-pollution particles on your skin. So, here I conclude this extensive section featuring some of the popular and best body wash for men along with a complete buying guide too. On the basis of general body demands of a man and requirements, I tried to pick such products which can go for all skin types without causing any side-effects. 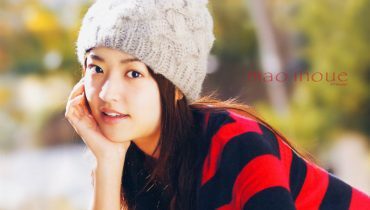 Of course, the modern work routine requires huge amount of dedication which means tiredness and lethargic body. A quick shower with amazing body wash can help you revive your body again and you can get back on your work with that positive approach once again.